When Trying to fax from System Five to WinFax Pro, You encounter an Error 126. This may be caused by a setting in System Five that is telling it that the WinFax Pro application is a fax server. In the System Five Navigator, go to Setup Tools, Printing Options, and Printer Setup. 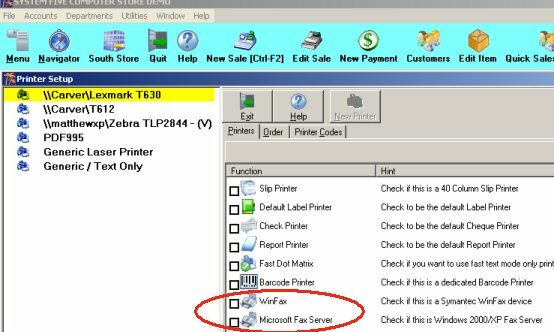 Now Highlight the Fax software by clicking once on it in the right hand window. And in the left hand window de-select Microsoft Fax Server if there is a check mark in the box adjacent to it. Then click in the box for Win Fax to put a check mark in it. After doing this it is a good idea to restart System Five. Once restarted the issue should be resolved.